At the end of a meal in Northeastern China, you might have the opportunity to order basi digua, or “pull-silk” sweet potatoes. The dish’s name may not be immediately apparent when it arrives: At first glance, it’s a plate of gleaming, sliced sweet potatoes, served alongside a bowl of ice water. But when you reach to take a slice of sweet potato, you’ll realize the meaning behind the name. The potatoes have been lightly fried, then covered in a thick layer of molten sugar. Pulling each piece of potato away from the rest will result in long, silk-like strings of sugar, that will immediately solidify. Soon, the dish will look like a spiky crystal, with shards of caramelized sugar going every which way. The bowl of ice water, as it happens, is very necessary: The potatoes are blisteringly hot, as is the sugar. Giving them a quick dip into ice water hardens their caramel coating, and cools the sweet potato enough to eat. Waiting too long, though, can solidify your basi sweet potato into a rock-solid mass. Sometimes, chunks of apple, strawberries, or taro get the basi treatment too. Be very careful eating basi sweet potato, as it is extremely hot at first. This Beijing restaurant also offers basi sweet potatoes. 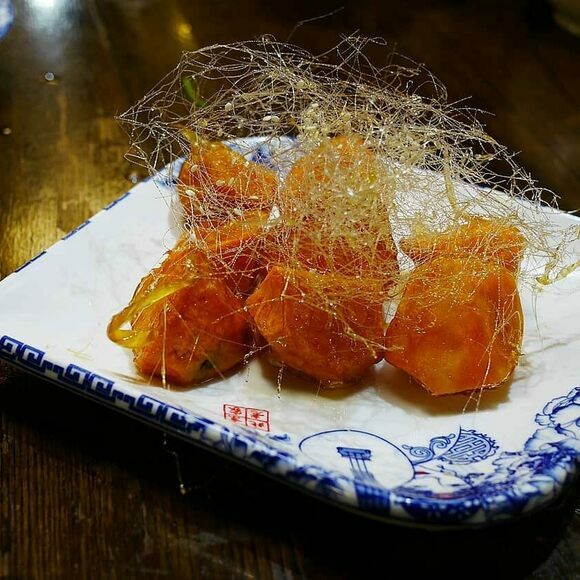 This Flushing restaurant offers dishes from the Dongbei region, including basi sweet potatoes. These sweets make convincing mimics of everything from fish balls to eggs to koi ponds.